The Pantex Plant, located 17 miles northeast of Amarillo, Texas, in Carson County, is charged with maintaining the safety, security and reliability of the nation’s nuclear weapons stockpile. 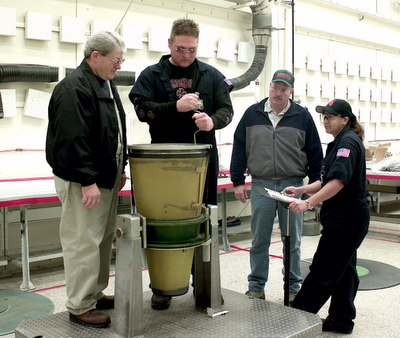 The facility is managed and operated by B&W Pantex for the U.S. Department of Energy/National Nuclear Security Administration. In 1942, the U.S. Army constructed the original Pantex Ordnance Plant on 16,000 acres. The mission of the Plant was to load and pack conventional artillery shells and bombs in support of the World War II effort. When the war ended in 1945, the site’s operations ceased and the land was sold to Texas Technological College (now Texas Tech University) in Lubbock. 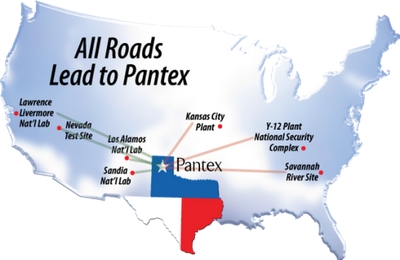 In 1951, Pantex was reopened and refurbished for nuclear weapons, high explosive and non-nuclear component assembly operations. By 1960, Pantex Plant had taken on a new high explosives development mission in support of Lawrence Livermore National Laboratory. Between 1965 and 1975, the Atomic Energy Commission moved various weapons modification, assembly and high explosives missions to the Plant from other facilities around the country. Pantex workers assembled thousands of weapons during the Cold War. The last new nuclear weapon was completed in 1991. Since then, Pantex has safely dismantled thousands of weapons retired from the stockpile by the military and placed the resulting plutonium pits in interim storage.